Paul Lindblad was a top middle reliever for many years in the American League. He is shown here after helping the A’s win their third straight World Championship by posting the best ERA of his career, 2.06. Just below the stat line with that information is a (somehow fittingly) terse textual note further attesting to Paul Lindblad’s capabilities: “Paul had 0.00 E.R.A. in 1973 series.” For some reason I’m inclined to believe he plied his trade with very little ego. He certainly seems in this photo to be far from displaying the air of complacent self-congratulation that supposedly has a tendency to infect members of a championship squad. I’m inclined to believe those words, but then again you can’t be much more of a baseball outsider than me, so all I can really add to the story of Paul Lindblad is the trivial, groundless, ridiculous belief that in the photo shown above he is trying to decide if he should finally grow a mustache. 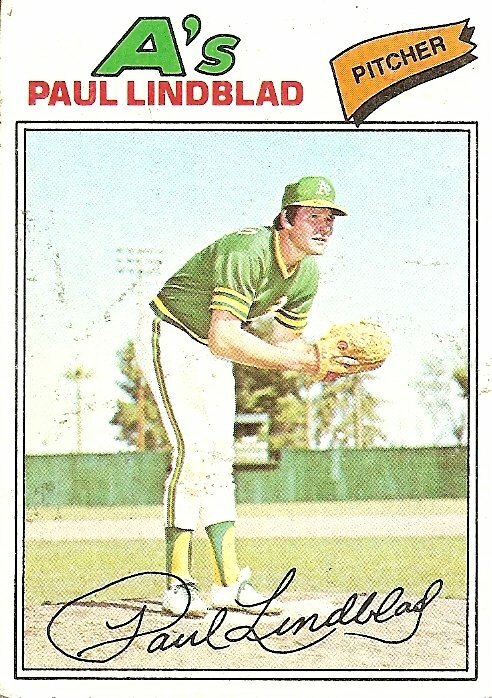 The hoopla that such an act might have once created is long gone, this card coming out three years after the A’s broke the baseball facial hair line in 1972. 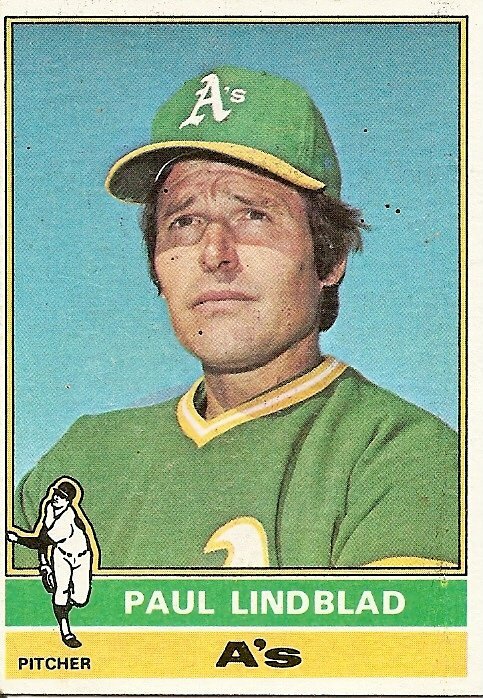 Not coincidentally, Paul Lindblad, after spending several years with the A’s prior to 1972, had been toiling for the Rangers that pivotal year, and by the time he returned to the A’s the hippie-lip revolution had already occurred. In fact, by 1975, players on all teams save for some last holdouts (such as Cincinnati), where conservative grooming codes continued to strain against the grain of the times, were busting out beards and mustaches, muttonchops and fu manchus. To have a mustache was no longer in any way a declaration of independence. It was merely a personal choice. And this is exactly when the world got confusing. This is exactly when the 1970s truly became the Me Decade. Everyone was on their own to make their own choices about everything. Grow a mustache, don’t grow a mustache. Do your own thing, don’t do your own thing. Who cares? No one. You’re on your own. While his stalwart professionalism is on display on the back of the card, the front of the card shows that he has yet to decide the quandary that has been on his mind since at least 1975. His upper lip remains bare, suggesting that he decided in the negative, but his expressive eyes overrule this suggestion, making clear that the matter remains unresolved. If anything, Paul Lindblad seems even more undecided. He is a year older, a fact that seems to register almost imperceptibly in his somehow slightly less ruddy features, and he seems to have grown a little more melancholy. 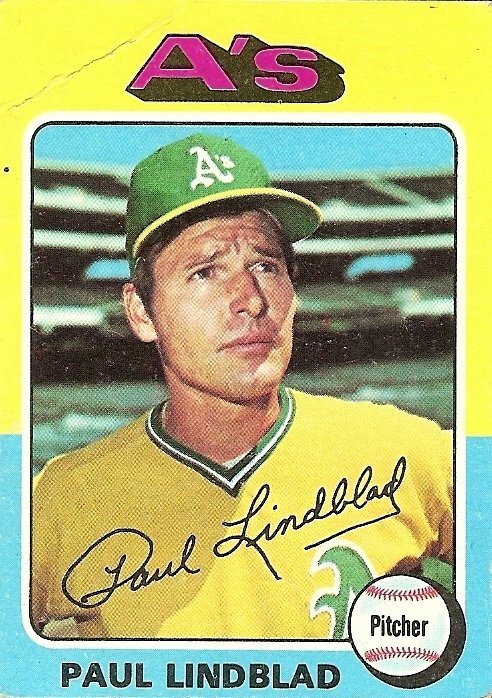 The featureless blue sky behind him, where the year before there had been the sheltering embrace of a ballpark, adds to the feeling that Paul Lindblad is a little more alone this year than he was the year before. Many of the championship A’s are still around, but they won’t be for long. And the biggest, loudest A of all, Reggie, has moved on. In the ensuing silence, Paul Lindblad continues to ponder. My father once told me that one thing that helped get him through the 1970s was his work. It wasn’t his happiest epoch. As suggested in the previous chapter’s description of my family’s early-’70s living arrangement, he began the Me Decade by going to unusual lengths to remain part of an “us.” After a couple of years of the ultimately aborted experiment in open marriage, he spent the rest of the decade living in a studio apartment in Manhattan while his family lived several hours away by Greyhound bus, in Vermont. This had to have been painful. But he had his work. He was a sociologist, for most of that decade a project leader on a research team charged with a massive evaluation of the effects of city services on all levels of the population. He threw himself into his work, as the saying goes, but quietly, selflessly. He was a Paul Lindblad type. He showed up day in and day out in a way that not only benefited the project he was working on but that helped feed much-needed money to the frequently imperiled utopian dream of his distanced immediate family. He wore a mustache for some of that decade. But this facial hair was never part of some rousing movement, large or small, like the swashbuckling 1972 A’s or the “let that freak flag fly” hippies. I have referred to it elsewhere as hair shrapnel, a piece of the general hairiness of the culture of the time that seemed to have landed randomly on my dad’s face. I don’t know if I got that right, however, for he had indeed made a decision to grow a mustache, and he had made it alone. He had then worn the mustache for some years. And then, in another solitary decision, he had chosen to remove the mustache. I can see him shaving it off one evening in the bathroom of his apartment, then leaving the bathroom to unroll his foam sleeping mat on the floor below the one window, going to sleep, getting up the next day, and going to work. “I absorbed myself in my work,” he once told me, speaking of the entire 1970s. As for Paul Lindblad, he is shown here still in the midst of his own increasingly solitary and still unresolved decision. The Topps people, perhaps attempting to dim the increasing pathos of another close-up of Paul Lindblad’s undecided face, have placed him in his workplace. This serves to distance the viewer from his face, but it also seems to lighten the expression ever so slightly, Lindblad not wrapped up quite so much in his unresolved solitary decision, instead able to put himself into the working mind he has been so adept at becoming absorbed in since breaking into the league over a decade earlier. Still, there is ample evidence that Paul Lindblad still has things on his mind. He has by now been left behind by most of the championship A’s. He perhaps senses that the end in Oakland is coming for him too. 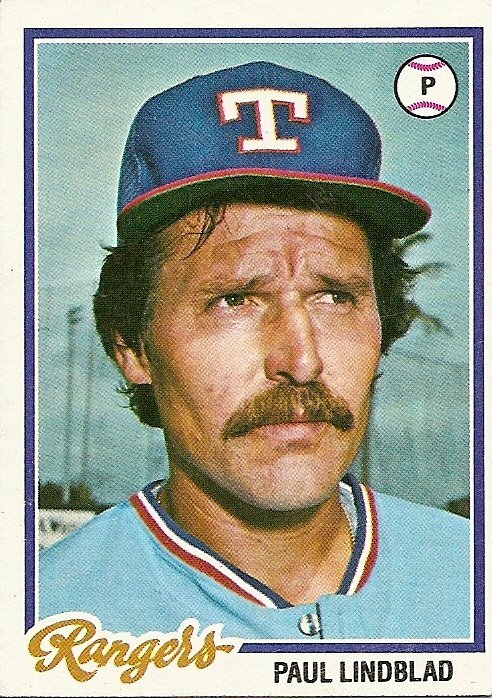 In fact, by the time I found this card in a 1977 pack, Paul Lindblad had been sold to the Texas Rangers. In such a world where the very ground can be pulled from beneath you, when your team can be taken away, when your family can be taken away, when the job you throw yourself into can be lost (my father, after spending years on the research project, lost his job near the end of the decade by the abrupt end of funding for the project, all the research halted before any conclusions could be reported), certain personal choices turn out to be all you really have left. They are the only thing you can control. And yet, they are pointless, absurd. To grow a mustache or not to grow a mustache, that is the question. The implied answer—what’s the difference?—lingers on the horizon like some kind of soundless cosmic tornado with the power to strip your world of all meaning. When I found out that Paul Lindblad had died, I also found out that through the last decade or so of his life he suffered from Alzheimer’s disease, that gradual, inexorable cosmic tornado. He is shown here on the brink of the 1978 season, his last in the major leagues. He started the year with the Rangers but was purchased by the surging Yankees late in the season. For what it’s worth, his last official moment in a major league uniform was as a participant in a world championship celebration. 1. Brilliant. I was imagining Paul to be, like me, a guy who didn’t wear a mustache because it comes in all patchy, uneven and discolored. But wham — that’s a classic pushbroom he’s finally got going there. There may be hope. 2. I notice that despite finally growing a mustache, Lindblad still looks troubled. I imagine now that he has taken the plunge he wonders if he should shave off his mustache. Facial hair is the eternal struggle for all men, either the constant battle of shaving everyday or making the decision to grow something- which will define you in a peculiar way. No one notices when I get a haircut, but if I grew a mustache or a beard, then the comments come pouring in. Opinion is generally divided and I enjoy shaving a little less area for awhile, before I eventually grow sick of it and impulsively hack it off (shaving facial hair is a arduous process that almost negates the value of shaving less while you had it). Linblad looks as though he is almost at to that day where he can no longer stand his own face and thus must start the process again. 3. The 1975 TOPPS cards were the first baseball cards I ever had. The weird bi-color border speaks to a certain place and time—the seventies. Paul Linblad was one year younger in his final season than I am now…it’s been an odd transition to be younger than everyone in MLB to being older than most everyone (thank YOU Julio Franco!!). 5. Occurs to me now that if Lindblad finished his career with the Yankees he was probably asked to remove his mustache before joining them. 6. I also don’t know what Paul Lindblad sounded like, so I imagine him saying that sentence in the voice of Paul Lynde. 7. Wonderful, once again Josh. I grew up in the Seventies. Accordingly, so much of that decade is a real part of who I am, and always will be. On my iPod, the only songlist recognized by decade is the 70s; I dig young women today wearing 70s styled clothes, like bell bottoms; and I still replay 70s strat-o-matic baseball and football seasons, trying to bring back the glory of those years. Even though, in retrospect, I should want to distance myself from those years (alcoholic Dad beating up Mom; Dad abandoning me and my three siblings when were all little; getting evicted all the time; living on foodstamps in horrible “projects”, holey pants and shoes), instead, I yearn for those years again. It’s my frame of reference, for all else. I love that decade, and it seems time just wants to forget about it. It is odd, that during the Amazin’ A’s run, Lindblad held out on the mustache, even though Finley offered players several hundred dollars to grow one (Finley was not afraid to employ creative marketing techiniques). Lindblad held out. And, then later, in the late 70’s when the A’s were dismantled, BAM! (that’s a Batman TV flashback), Lindblad comes out with that major, impressive ‘stash. Why now? Why now Paul? I think, it’s because he longed to have what he had before. He longed to return to better days. He sought what will never be again. And so it goes. Two years ago, I joined a rock band. All we play is 70s music. And, recently, I’ve grown in a nice pair of sideburns. My healthy chops cause other lawyers in my new law office to wonder what’s up with the new guy and his sideburns. It does not bother me. I’ll just do my job, and do it well, as Paul Lindblad did. 8. Checks to see if this site accepts HTML. Guess not. Didn’t Steinbrenner allow mustaches back then? I thought that it was beards that were forbidden. 9. I was most taken by the signatures on 2 of the 4 cards. While they are different–what’s the likelihood that they’re even Lindblad’s?–their perfect penmanship and showy flourishes on the P, L, and D belie his taciturn facial expressions. 10. 8 Ennui: You’re right about the Yankee facial hair rule. Reggie had a soup strainer, after all, and then of course there was Sparky Lyle’s famous walrus. Munson caused a stir by growing a beard once, and after a few days he shaved it when Billy Martin asked him to do so as a favor to him. “How do you make something bold/underline/linked in the comments? To make something bold, surround it with asterisks. To make something underlined, surround it with underlines. To link to comment 31, surround the link number with brackets, like this: 31. 11. 9 I also gazed for quite a while at those signatures. I love how the earlier year’s effort morphs into the also flamboyant but more symmetrical version in the later year. 6 Paul Lynde deserves greater renown. Maybe the voice of Roger the alien on American Dad is part of a trend toward some sort of societal Paul Lynde retrospective. 12. During the 1980s, Lindblad was the pitching coach at the Double-A ballpark where I grew up going to games. Somewhere I have a picture of my 12-year-old self posing with him at one of those meet-the-players clinics. He’s wearing a gigantic mustache. Rick Cerone had quite a stache. 14. Another wonderful post. It’s great to see you getting so much great feedback. Keep it up, brother. I love it! 15. Him having that ‘stache in the last photo reminds me of Ned Flanders. Ladies and gentlemen we have finally found Conan O’Brien’s father. Of course his mother is the angle-jawed alien, Maria Shriver (now Schwarzenegger). Paul was a friend of my dads.We lived in Riverside,Ca in the 70’s.Every time The A’s played the Angels.Paul would come to our house for dinner and would stay over now and then.I was in my early teens then. I can say for fact he was a great guy.The whole neighborhood would be at our house.He always had time for kids.He would leave tickets for us everytime Oakland was in town.We got to sit with the players wives.God what a great set up for me as a kid. I got to meet Joe Rudi and would sit by Rollie Fingers wife.I was a big time A’s fan then.Paul never washed his underwear he would just wear new ones once and toss them.I remember over hearing my mom say this and thought it was funny.I always remember Paul with a mustache by the way.Thanks Paul for all your kindness I’m sorry to hear you have left us.You are missed.You were a good man! coryross4: “Paul never washed his underwear, he would just wear new ones once and toss them”,… maybe he had the George Brett pants-shitting problem we heard about in the video.